There is a great deal to admire about the Touring Consortium Theatre Company’s latest production, Brassed Off, both as a slice of sophisticated, characterful British theatre, an effecting yet not overbearing observation on the decimation of the mining industries and communities of the 80’s and early 90’s, and as a production as a whole. Brilliantly in-keeping with the shows overall message of community solidarity and supporting the everyman, this touring production has invited local brass bands to provide the titular accompaniment on each leg of its run, and it’s week-long engagement at the Wolverhampton Grand theatre has seen that opportunity fall upon the Jackfield Brass Brand from Shropshire. 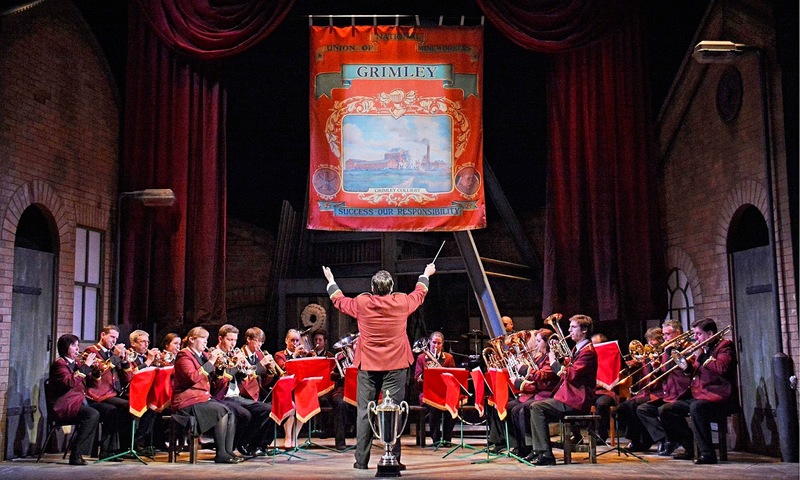 It is no gimmick or marketing ploy - the brass bands in question form the heart and soul of Brassed Off’’s very raison d’etre, and the knowledge alone that it is such working folk as are depicted in the show on stage, performing adds a nice sense of poetic symmetry to proceedings, and further cements the sense of camaraderie lain down by the astute writing and talented cast. 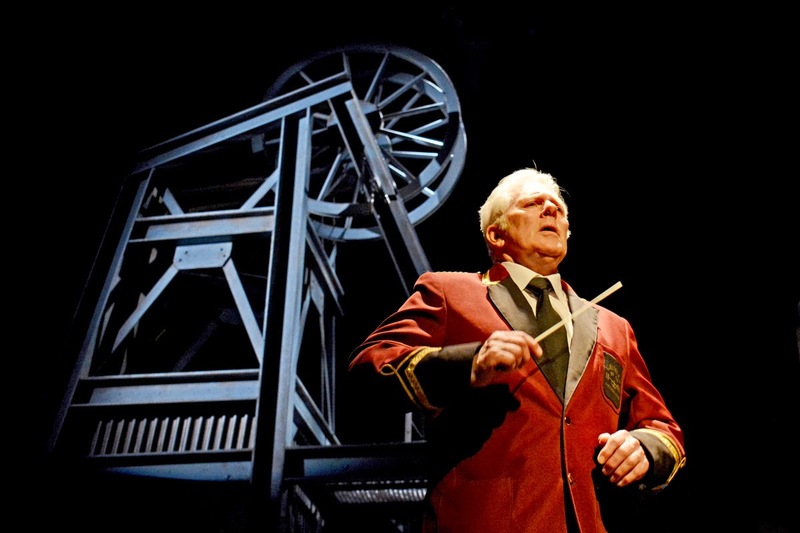 Based on the 1996 film of the same name, which featured Pete Postlethwaite, Tara Fitzgerald and Ewan McGregor, and went on to nab a handful of BAFTA nominations and international acclaim, Brassed Off tells the story of the fictional mining community of Grimley. It is the 1990’s, and as Pulp sound on the airwaves with ‘Common People’, such folk in the last remnants of the mining community are clinging on to the final tendrils of their way of life. Money is tight, families cannot afford their weekly shop, and the impending potential closure of the Grimley mining pit has its workers, and their relatives, reaching for their pickets. The powers that be offer gradually increasing yet still paltry redundancy offers, though the word on the town is the offer itself is a masquerade for a closure decision long since made. Whilst Brassed Off mostly, and understandably, omits much of the frictions and fissures that erupted within communities and even inside of families at such a time, the reality and impact of mine closures and the industrial belt-tightening of the time rings heavy and true. Luke Adamson as Shane acts as a narrator of sorts, and we follow primarily the plights of his family, father Phil (Andrew Dunn) and mother Sandra (Rebecca Clay), as well as the tight-knit community around them at this critical juncture in their lives. Clay is particularly effective as desperate mother Sandra, first being forced to skimp on essentials and later enduring a devastating visit from the bailiffs, and it is a dynamic levied beautifully with Andrew Dunn’s depiction of Phil as a well-meaning, hard-working decent sort torn between what to do in increasingly hopeless circumstances. Amidst the social and political doubt and unrest, it is Phil’s father Danny (John McArdle) who remains steadfast as a hub of the community with his colliery brass band, to which Phil and his colleagues also belong. Danny repeatedly eschews that music, and the band itself, will outlast any of the communities woes, and the community itself, having already stood the test of time. He is firm, principled and portrayed with real conviction by McArdle, and thankfully the show does not miss out on the opportunity of illustrating that however noble his intentions and his blinkered, narrow-minded view may be, set as he is on winning a prestigious band competition that will culminate at the Royal Albert Hall, he is obtuse and ignorant to the more human and everyday difficulties piling up against those around him. Throw into the mix a well-rounded and wonderfully performed troupe of supporting characters including a blossoming romance between local ladies man Andy (James Robinson) and homecoming graduate surveyor Gloria (Clara Darcy) and the similar plights of Phil’s colleagues Harry (Andrew Roberts-Palmer) and Jim (Kraig Thornber) and their protesting (literally) wives Rita (Helen Kay) and Vera (Gilly Tompkins), and you have in Brassed Off a surprisingly well-balanced ensemble piece that as mentioned exudes a palpable sense of community spirit and fellowship. If it all sounds a dash morose or downbeat, then fortunately Paul Allen’s adaptation of the already-excellent original screenplay by Mark Herman has plenty of levity and comedy throughout, which is mostly derivative of the characters themselves, and feels far more truthful and endearing as a result. A scene early in Act II, for instance, is very simple and fairly conventional on paper - a drunken Harry, Jim and their wives return home from a night of drinking acting suitably inebriated and infantile - yet the performances are so sincere, naturalistic and beautifully observed that it had the audience in fits of hysterics. Similarly, the brass band sequences themselves, though perhaps not quite as prevalent as may first be expected (the characters and story, rightfully, take precedence) are a genuine delight throughout, and range from a rousing ‘Land of Hope and Glory’ to far more poignant and moving renditions of ‘Danny Boy’ and ‘Jerusalem’. The Jackfield Brass Band do a superlative job of investing each musical sequence with real vigour and presence, and are every bit as captivating and stirring as any orchestral accompaniment could hope to be. The cast are uniformly terrific, as mentioned. Luke Adamson is supremely endearing and spritely as Shane (at all ages), and Clara Darcy is evidently an exceptionally gifted actress who mines real depth and dimension from Gloria. McArdle brings an Earthy presence and gravitas to Danny, and enough praise cannot go to Andrew Dunn and Rebecca Clay as Phil and Sandra, so it is worth repeating what great, empathetic and at times moving work both do with their characters and the dynamic between the two. Kraig Thornber and Andrew Roberts-Palmer steal scenes with relish and aplomb as Harry and Jim respectively, and Gilly Tompkins is a veritable explosion of comic energy and Northern charm as Vera, Jim’s wife who is small in stature but has character and presence in abundance. 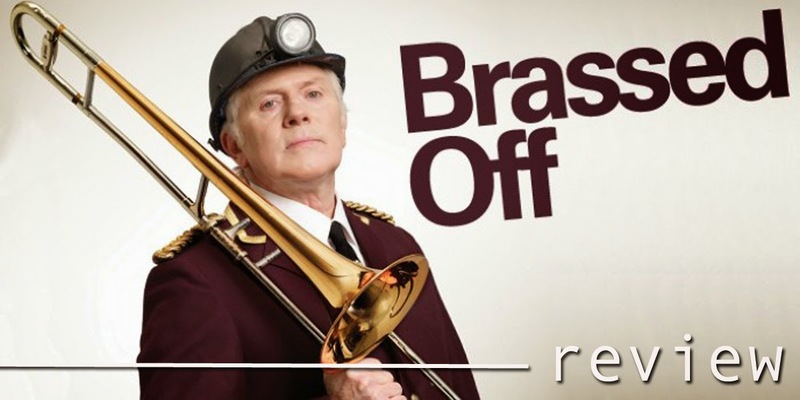 Brassed Off is a triumph, a wonderful celebration of British fortitude and community sprit that both champions aspirations whilst also bravely exploring the realities of the hardships and woes that faced a whole swathe of an entire industry, populace and generation. It somehow manages to be both uplifting yet sobering, feel-good yet somewhat forlorn, and along the way peaks with some exceptional performances from both its talented cast and the wonderful brass band sequences themselves. It is hearty, heartfelt stuff, and exactly the kind of characterful, impacting calibre of theatre that, like Danny’s colliery band, helps demonstrate the best of British and deserves to still be playing long after we’ve all checked off to the great Royal Albert Hall in the sky. 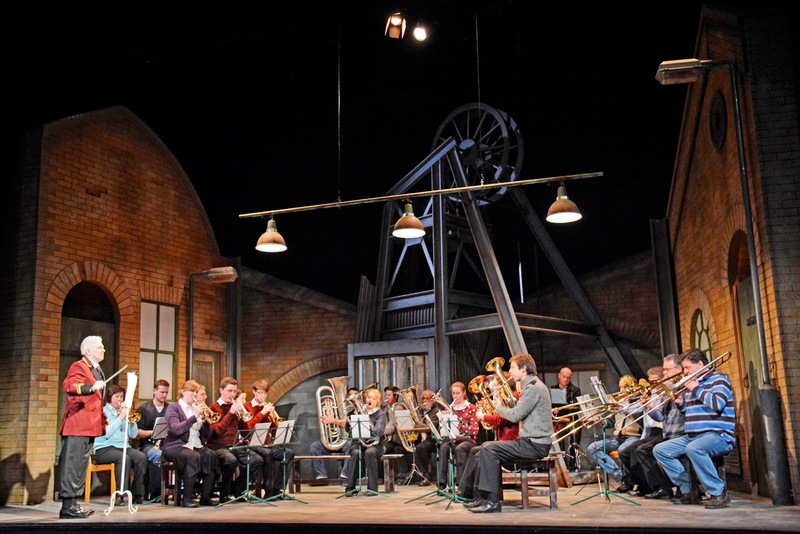 BRASSED OFF is running at the Wolverhampton Grand Theatre from Tuesday 08 until Saturday 12 April 2014. 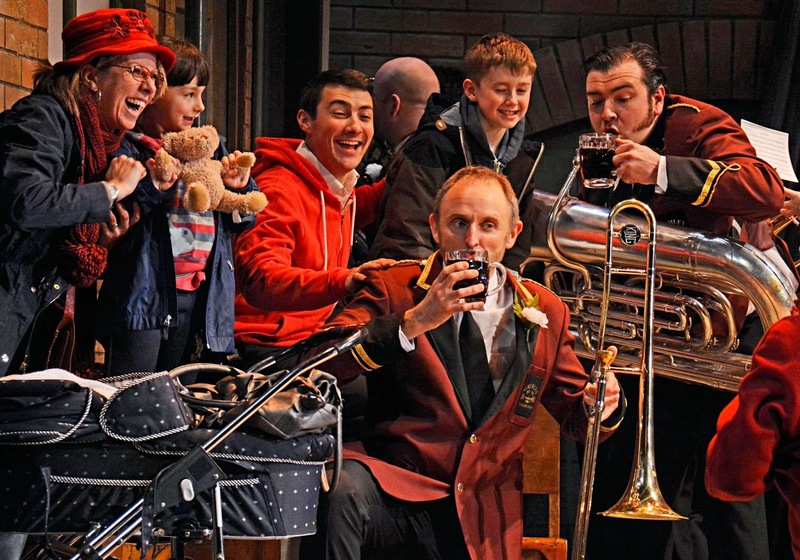 Press tickets for this performance of Brassed Off were provided courtesy of the Wolverhampton Grand Theatre directly. (A)musings Media gratefully acknowledges their generous invitation and support.